We understand that some patients may be hesitant in undergoing dental treatment. For patients with elevated levels of fear, anxiety and or dental phobia Oral Conscious Sedation may be ideal. 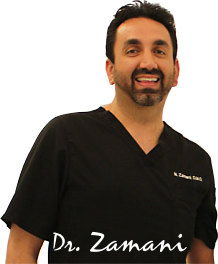 Whether you are a patient with minor anxiety issues needing some assistance with mild relaxation during treatment, or a patient who has avoided the dental chair for years due to extreme fear, Sedation dentist, Dr. Zamani has the knowledge and the expertise to help you remain comfortable throughout the treatment process so your needs for health and care can be met properly. You probably have never associated being relaxed or finding enjoyment with going to the dentist. Now you can! With sedation dentistry you can have one or more dental procedures performed in the same visit with the use of oral conscious sedation. This means that you’ll be conscious but unaware of the odors, sounds, tastes and pain typically experienced with most dental work. Sedation dentistry is about more than removing fear and pain from your dental visit. It’s about practicing effective dentistry in a way that benefits today’s busy lifestyles, which means we can now do in a single visit what used to require several visits to accomplish. This makes dental sedation an ideal solution for people on the go. Sedation dentistry is extremely efficient and easy on you, the patient. The procedure requires that you only have someone drive you to our office and back home since you will need to take a pill the night prior to your dental visit, and another one will be given during your appointment. The sedative medication is known as Triazolam or benzodiazepines, which typically has no side effects and acts quickly to calm anxiety or aid with insomnia. Upon arrival to our office, you will be treated like family by our skilled team of dental professionals and your vital signs will be monitored during the entire process. Within about an hour the medication will have started to work on you systemically, and when you are fully relaxed the sedation dentist Dr. Zamani will gently take care of your dental procedure. Sufficient sedation will be supplied depending on the type of dental work being performed during your visit. When your dental work is completed, you will be assisted to our relaxation to allow a family member or friend to drive you home to enjoy the remainder of your day. If you suffer from severe or intense anxiety, please let us know and we will make accommodations to provide you with your oral conscious sedation to ensure that you are perfectly relaxed during your visit. For expert sedation dentistry or questions, contact Sherman Oaks sedation dentist Dr. Navid Zamani at DENT-ALL® by Dr. Z. You won’t find a more caring dental sedation professional in the Los Angeles Orange County metro. We serve patients in the Sherman Oaks – Los Angeles – Beverly Hills – Santa Monica – Irvine California area. Call today to schedule your appointment. Dr. Zamani received his sedation certificate from DOCS Education, which trains most dental professionals in the use of sedation dentistry.